Pruning, a most important horticultural operation, which consists in removing a portion of a plant for the benefit of that which remains. The operation may be required by all plants which have an above-ground stem, even the most delicate. It is performed either to induce a vigorous growth, or to diminish vigor and dwarf a plant; a tree which does not bear is pruned to increase its fruitfulness, or it may be pruned to prevent over production. It requires to be done understandingly; and so much injury has resulted from indiscriminate pruning, that certain cultivators go to an opposite extreme, and advise not to prune at all. Where trees grow in a dense forest we find tall straight trunks without a branch for 50 ft. or more, and at the top a small branching head, that in size is quite out of proportion to the trunk; when such trees are felled and sawed into boards, we see by the knots that a natu-. ral pruning has been carried on for years; the lower branches of the trees were so excluded from the light by the growing tops that they were smothered and fell away, while the wounds were closed so neatly that no external indication of their presence is manifest. Trees of the same species with those which grow in the forest, when found as isolated specimens, are much shorter, but clothed with branches from the base upward. In this country pruning has until recently been regarded as belonging only to fruit trees, but in those parts of Europe where forestry is a distinct art, forest trees are pruned with a view to their future uses for timber, and while some are made to grow with a clear straight trunk, in other cases their branches are encouraged and so directed as to form knees required in ship building. In this country pruning is most frequently done upon old orchards, in which the trees have been left to themselves since they were first planted, and are unfruitful except on the extreme outer twigs on account of the crowded condition of their heads, in which branches cross one another in a confused mass, impenetrable to light and air. 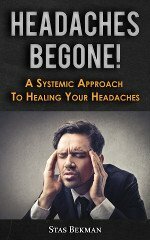 In such cases all that need be done is to remove the superfluous wood in such a manner as to leave an evenly balanced and open head. The intelligent fruit grower will prefer to set trees only one year old from the bud or graft, and they will be either simple wands or stems, furnished with buds along their length, or a few of the upper buds may have pushed and formed branches; with a tree like this to start with, he can form the head at such height as best suits him, and determine itsbranch-ing. The uppermost buds of a young tree or branch are the most vigorous, and start the soonest in spring; if left to itself, such a branch or young tree will produce a few strong shoots at the top, those below will be gradually weaker, until those at its lower part, being robbed of all nourishment by the rapidly growing shoots above, will not start at all. Such a branch or tree as this may be cut back so that the lower buds only will start and produce shoots, which will ripen into three or four branches, and these will be strong, from having all the nutriment that would have been divided among numerous shoots were it left unpruned. Similarly, the ramification, and consequently the whole head of the tree, may be directed and controlled at will. The effects of judicious pruning upon young trees are strikingly shown in apple and pear trees, which at the end of four or five years of systematic pruning are complete pyramids, with the base near the ground, and the branches equally distributed and gradually diminishing in size to the top. - Pruning is frequently resorted to when trees have become stunted and almost ceased to grow; if the top of such a tree has its branches judiciously cut back, the remaining buds, having to themselves the sap which was formerly divided among the whole, will produce vigorous new shoots, and this will be responded to by a new growth of roots, and the whole tree will be invigorated. These instances have reference to the wood growth of the tree; whatever favors that diminishes the production of fruit, and vice versa; hence the pruning to induce fruit-bearing is quite different from that to promote vigor of growth. If a tree is severely pruned soon after its leaves are developed, it receives a sudden check, and it is the tendency of all such shocks to induce the tree to propagate itself by seed; instead of preparing for an extended growth of branches the next year, many of the buds, which would otherwise have produced leafy shoots, become fruit buds. In practice, pruning to produce fruit is not done in this severe manner, but by stopping the extension of a portion of the shoots after they have made a certain growth; as this is done when the shoots are so tender as not to require a knife, it is termed pinching. By careful management the form and fruit-fulness of trees may be controlled with but little use of the knife; buds which would produce branches where they are not wanted are broken off soon after they start to grow, and by checking the prolongation of other branches at the proper point an equal distribution of sap, and consequently of growth, is maintained over the whole tree. - Root pruning, or removing a portion of the roots, is resorted to for the purpose of controlling the size of the tree, to produce fruitfulness, and to allow the tree to be transplanted. Some trees, especially forest and ornamental ones, produce long roots with very-few fine fibrous rootlets, and are difficult to remove unless prepared a year beforehand; the long roots being cut off within a moderate distance of the trunk, the shortened roots will form numerous rootlets, and at the end of a season may be transplanted with safety. Root pruning is one of the readiest methods of checking the too vigorous wood growth of trees and throwing them into bearing; it consists in opening a circular trench around the tree, at a distance governed by the kind and the vigor of the individual, and cutting off with a sharp spade all roots which extend outside of this circle; sometimes half the roots are operated on one year and the other half the next. - The proper time for pruning trees has been the subject of much discussion; wounds heal over most rapidly if made after the season's increase in length is completed, and the fully developed leaves are engaged in maturing the buds and preparing for the growth of another year. This time, since it occurs in summer, is usually an inconvenient one, and the end of winter or very early spring, before vegetation starts, is the season generally selected; this has reference to the removal of branches. Summer pruning, or pinching, is done at the time when its objects can be best accomplished. Whenever it may be performed, the utility of pruning will depend upon the intelligence of the operator, who should understand the laws of plant growth and the peculiar habit of each tree. The peach, for example, produces its flowers and fruit along the branches which grew the preceding year, and is generally much benefited by having these branches shortened in, or cut back, for one third or more of their length; the horse chestnut, on the other hand, produces its flowers and fruit from buds at the ends of branches of the previous year, and if the cutting back so useful to the peach were practised on this, all the flowers would be destroyed. In some plants, like the grape, there are several different methods of pruning to obtain the same result. With the grape, pruning is so intimately related to training that it is difficult to treat of the two separately, and this is especially the case with fruit trees grown upon walls and trellises, whether as espaliers or by the cordon method. 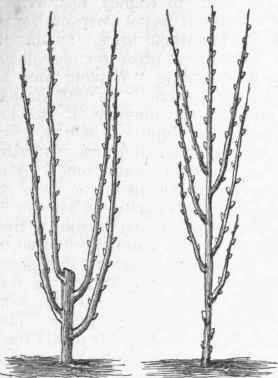 In this country the climate does not require the highly artificial ' methods of training, and the pruning to effect them, so common in Europe; these are given in various English and French works upon fruit culture, and with special completeness in Du Breuil's Cours élémentaire d'arboriculture. - As a mechanical operation, pruning requires some skill and care; large cutting is done with a saw made for the purpose, the teeth of which are set wide. An axe should never be used. The wound made by the saw should be smoothed with a drawing knife or other tool, and covered with shellac varnish, melted grafting wax, or thick common paint, to prevent decay before a new deposit of wood and bark covers it. Every branch should be cut close to the trunk, or other branch to which it is attached; if a stub, or projection of a few inches, be left, this will not heal over, but in time decay will set in, which may extend to the whole interior of the tree. The decay of many orchards may be traced to this fault in pruning. For the removal of branches two inches in diameter or less, a heavy chisel made for the purpose, and driven from below upward with a mallet, makes quick and neat work. A heavy knife is used for the removal of twigs, and for shortening young growths; shears made for the work do it quicker, but do not leave so clean a cut as the knife, though in many cases they answer. 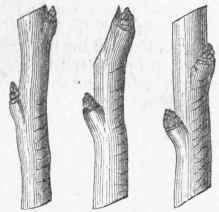 In shortening a twig or small branch, the cut should be made at a bud, and as the shoot from this will continue the upward growth of the branch, it is of some importance to cut to a bud pointing in the desired direction, as the future shape of the tree will be materially influenced by it. Cutting must not be done too far above a bud, as this will leave a stub which, having no leaves to sustain it, will die down to the bud; if the cut is made too close to the base of the bud, there is danger that it will dry out or be otherwise injured; the proper cut is made by placing the knife at a point opposite the base of the bud, and bringing it out, with a slightly upward slanting cut, opposite the apex of the bud. Fig. 1. - A Young Tree Pruned and Unpruned. Fig. 2. - Eight and Wrong in Pruning. Fig. 3. - A Pyramidal Tree, produced by proper Pruning.